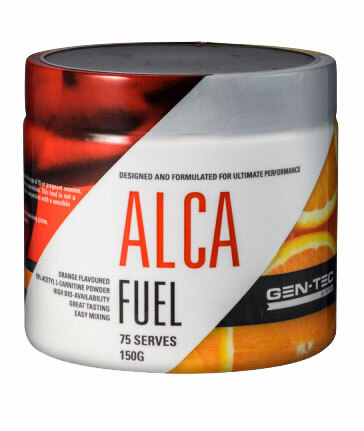 Gen-Tec Flavoured ALCA Fuel delivers a potent 2g dose of Acetyl-L-Carnitine per half teaspoon providing 75 serves. Flavoured ALCA Fuel is ideal for those looking to lose extra kilos, whether it be the competition bodybuilder in the dieting phase, athletes wishing to maintain a lean physique or any individual wanting to shed unwanted bodyfat. Acetyl-L-Carnitine (ALCA) works as a fat transporter, to shutte fat into the "powerhouse" (mitochondria) of a muscle cell to be used as a source of cellular energy to fuel the muscle, thus aiding fat loss. Gen-Tec Flavoured ALCA Fuel may also help you focus during your training sessions and may assist cognitive function due to the ability of Acetyl-L-Carnitine the "acetylysed" version of L-Carnitine to cross the blood-brain-barrier and support production of acetyl-choline (neurotransmitter). Gen-Tec Flavoured ALCA Fuel is HPLC tested for purity and quality assurances. Mix ½ teaspoon (2g) of ALCA Fuel with 200ml of water and consume 20 - 30 minutes before exercise. Ideal for cardiovascular exercise or weight training. Ingredients: Pharmaceutical grade acetyl l-carnitine (93%), flavour, silicon dioxide, colour, sucralose.